SAN FRANCISCO, CA: Beginning this week, the estimated 10 million annual visitors to the Golden Gate Bridge will enjoy an even more robust and remarkable experience when visiting San Francisco’s most iconic landmark. As part of the Golden Gate Bridge’s 75th anniversary year-long celebration, the Golden Gate Bridge, Highway and Transportation District and the Golden Gate National Parks Conservancy—in cooperation with the National Park Service, Presidio Trust, and the City & County of San Francisco—have made significant enhancements to how visitors experience and enjoy the much-loved span. The new facilities and services open officially to the public on Tuesday, May 8, 2012. Thanks to its partnership with the nonprofit Golden Gate National Parks Conservancy and the National Park Service, the Bridge District was able to assemble a team of historians, artists, architects, exhibit designers, and naturalists to enhance the Golden Gate Bridge visitor experience. • The Bridge Pavilion, located in the renovated Bridge Plaza on the southeast side of the span, is a 3,500-square-foot “green” building designed to serve as a visitor orientation and welcome center. Rare Bridge artifacts and photographs are complemented by interpretive panels and exhibits presenting the Bridge in its many contexts, while a new museum store further engages visitors through a wide offering of unique educational and commemorative items. The Bridge Pavilion is open daily, year-round from 9:00am-6:00pm. • The Art Deco Round House has been renovated to serve as the starting point for new guided public tours of the Bridge. Incorporating the latest audio broadcasting and listening technology, visitors may sign up for 45- or 60-minute guided walking tours on the Bridge, including the first-ever night tours. Offered daily spring through fall, adult ticket prices start at $12.95 per person; reservations may be made online at goldengatebridgetour.com or by calling 877-349-7625. • Also in the Round House, visitors will discover the Bridge Photo Experience, where they can take a virtual photo placing themselves in daring Bridge backdrops, such as the top of the Bridge Tower. Experience photos are available daily year-round; package cost is $20 per person plus tax. • With both ends of the Bridge anchored by the Golden Gate National Parks—and the Bridge itself serving as a connector for major trails—a key part of the visitor improvements project has focused on the surrounding landscape. Improvements include enhancements to the Coastal and Bay trails; significantly better bicycle access to the Bridge; creation of the new Golden Gate Overlook in the Presidio offering spectacular panoramic views; and new way-finding and interpretive signage to encourage appreciation and exploration of the national parklands on both sides of the span. • Reinforcing the National Park Service’s Healthy Parks, Healthy People nationwide initiative, a new menu in the Bridge Café offers healthy, affordable grab-and-go fare and beverages featuring locally-sourced and sustainable ingredients. • Visitors can prepare for their trip to the Bridge with the newly-launched GoGGBridge app, available for iPhone and coming soon for Android devices. This free app is packed with maps, tips, fun facts, and more. Download works best with an existing wireless network. The 75th Anniversary of the Golden Gate Bridge is a project of the Golden Gate Bridge, Highway and Transportation District and the Golden Gate National Parks Conservancy in collaboration with the National Park Service, Presidio Trust, and the City & County of San Francisco. The year-long celebration and visitor experience improvements are funded by private contributions, with major underwriting provided by Wells Fargo, Genentech, HP, and Kaiser Permanente. In addition to the improvement projects, anniversary events include the Golden Gate Festival along the San Francisco waterfront on May 27, 2012 and 75 Tributes to the Bridge, a year-long series of public programs by community organizations presented throughout the Bay Area in 2012. 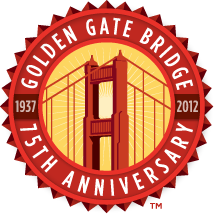 For additional information and all public inquiries, please visit www.goldengatebridge75.org.